Currently, we offer Visual Arts Diploma with two modules, equivalent to any 2-year diploma in visual arts or fine arts. Dates don’t suit? Enrol to our mailing list and we will inform as soon as the next batch opens for enrolments. 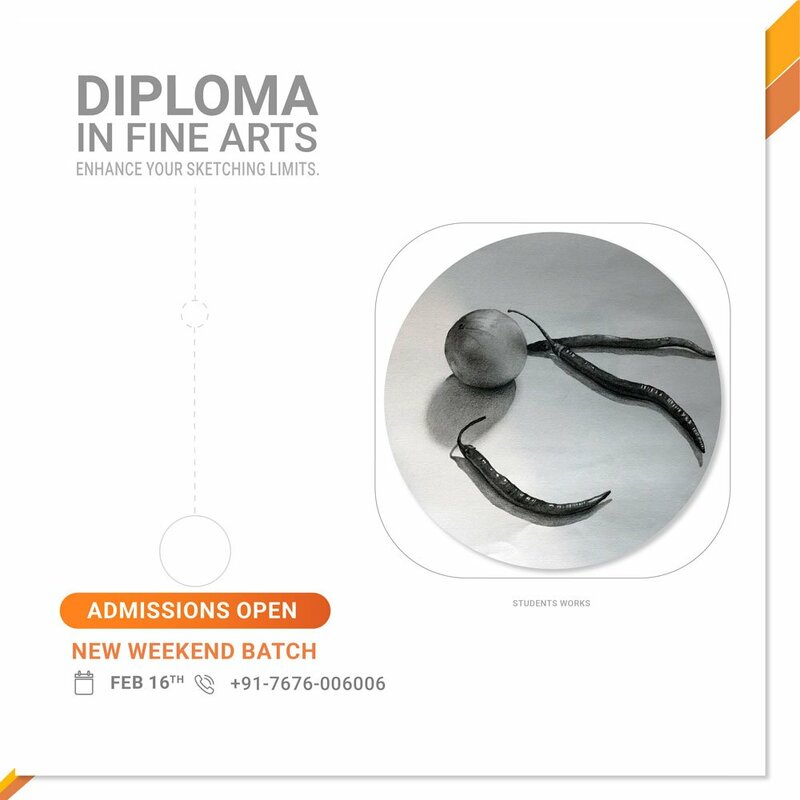 Fine Arts Foundation course offered by Sampratishta School of Fine Arts & Design is for individuals wanting to pursue higher education under fine arts streams. Students are immensely benefited by learning different skills, sketching styles and techniques that will help them develop their knowledge and pursue their fine arts career with a higher rate of success. Fine arts refers to the art form that focuses on aesthetic purposes. 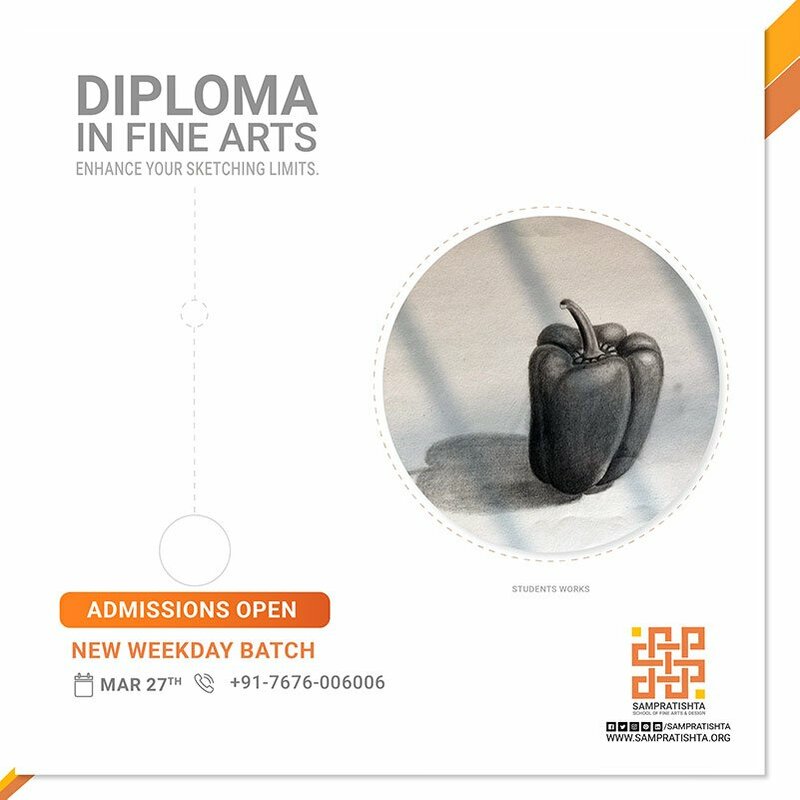 Our ‘Fine arts foundation course’ is a rigorous basic level training that focuses on building a strong foundation for greater sketching, fine art skills, and understanding. It involves developing art and design techniques using the Monochromatic medium. Courses are consolidated and cover the most important topics that are necessary for providing a strong foundation. We teach in-depth about the essential skills techniques for sketching and developing the most effective skills to produce an artwork. With this training, students are exposed to greater levels of understanding and can see advancement in their sketching and fine art skills. Our faculty has the best artists willing to impart knowledge to our students and help you in your career progression. A clearer understanding of the career and its path will help the person have a higher rate of success than others. Finally, they will stand out from the crowd and will more likely find work opportunities. Foundation Course Certificate from the institute. Please note, it’s not affiliated with any of the university yet. You will be having 25 finished assignments to complete and submit. And your every assignment will carry 5 marks in total 125 marks. Your attendance will grab 12 marks. And your final exam test will have 33 marks. You can score most 170 marks. Your successful course term will discount a diploma certificate from the institution. Over 24 in-depth classes with 50 hours of content! Your 12 weeks term will have 9 topics lecturing and you should not miss any lecturing session. If you miss any, we won’t take it again for a single student but you can cover the topics attending the evening or morning batch. You can make the payment by pressing the Get admission button below. Kindly note other than NEFT the bank will charge 2% convenience fees; if you are conscious about extra damage then choose NEFT in steps. I don’t use PAYTM, can you help? Yes, use this QR code and pay the fees with 0% convenience fees with BHIM or Google Tez Apps, it’s really fast. Do allow us a day to send you the course confirmations after your payment. The admissions are allowed only on invitation. You will receive a final course enrolment confirmation mail with your roll ID. Your 12 weeks term will have 10 topics lecturing and you should not miss any lecturing session. If you miss any, we won’t take it again for a single student. 3 consecutive absents in your term will consider as discontinuation of your course and you won’t able to attend the rest classes, as well as the exams. You will be having 21 finished assignments to complete and submit. And your every assignment will carry total 113 marks. And your final exams test will have 60 marks. You can score most 185 marks. Currently, we offer a Visual Arts Diploma with two modules equivalent to any 2-year diploma in visual arts or fine arts. Dates don’t suit? Enrol yourself to our waiting list and we will inform as soon as the next batch opens for enrollments. Admissions for weekdays batch is open now! Your 12 weeks term will have 9 topics lecturing and you should not miss any lecturing session. If you miss any, we won’t take it again for a single student. Appreciations and feedbacks, they said with heart. working hard to Inspire & build an Artist in you.